“The females are aggressive and snappy, the men are lazy and don’t move too much”. Our tour guide could make animal sounds that attracts them even further, but as always females are less likely to give up on their character. She was snappy indeed. When our guide, tried to sprinkle water on her gently, she snapped and her teeth was visible. He says “Women don’t let you touch her, it makes her angry”. We found another female behaving the same way. She did not even care to come closer. We aren’t talking humans, we are talking alligators today. 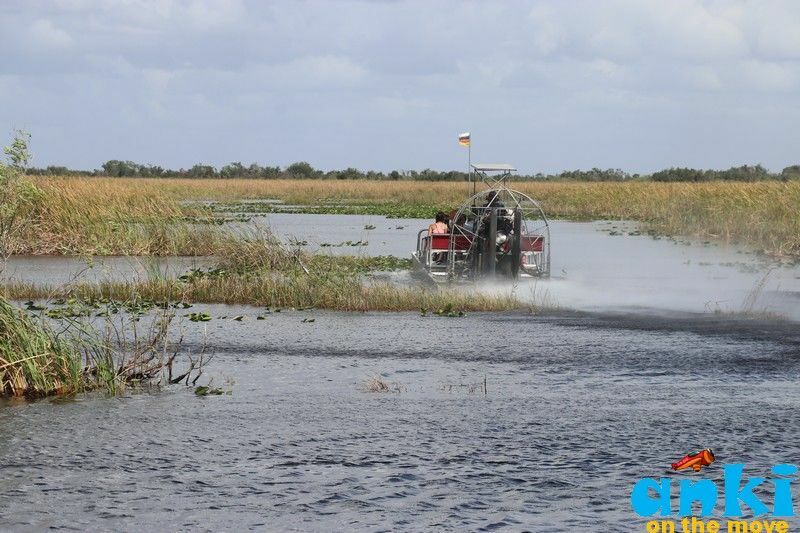 Our speedy Airboat propelled by an aircraft-type propeller zipped along the marshy wetlands of Everglades National Park in an unforgettable boat ride that anyone in Florida must take. 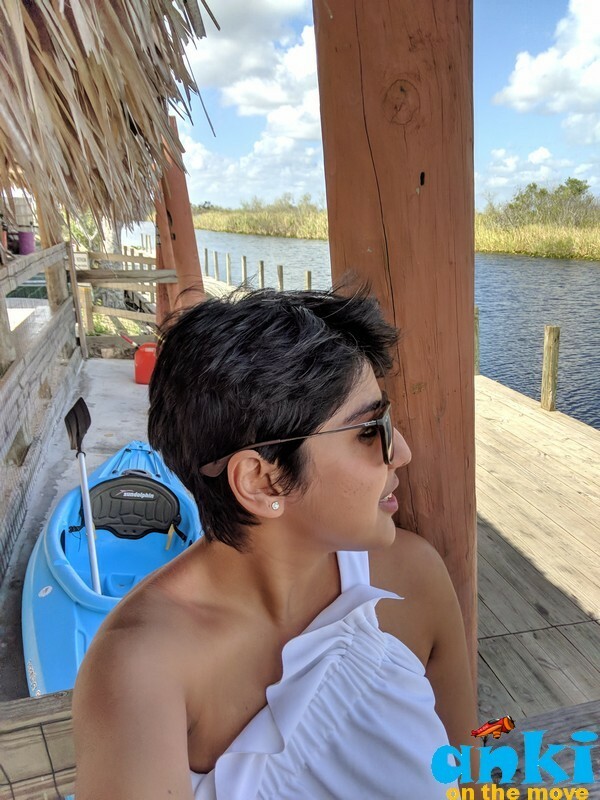 Along the way, we spotted alligators next to us, wild bird on our boat and a visit to an abandoned island that once belonged to a family of the Miccosukee native tribe. 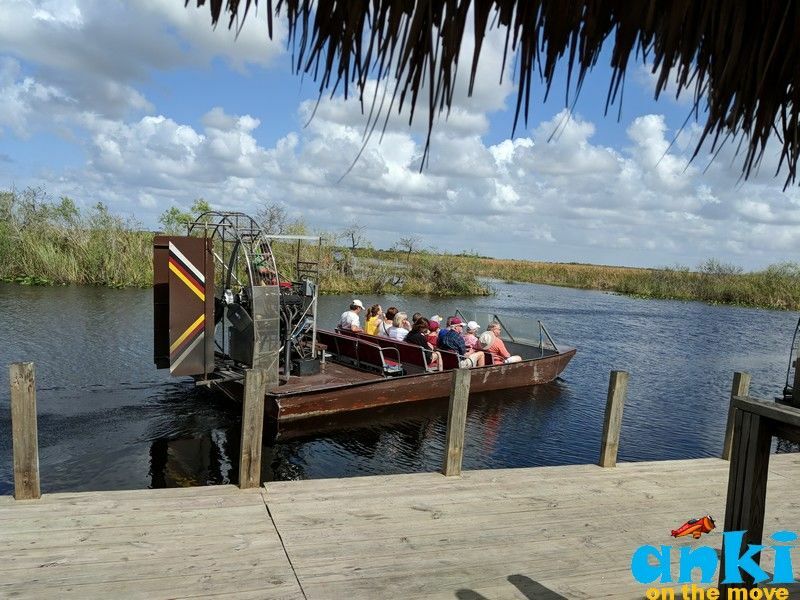 An Airboat, also known as a fanboat, is a flat-bottomed vessel (Jon boat) propelled by an aircraft-type propeller and powered by either an aircraft or automotive engine. 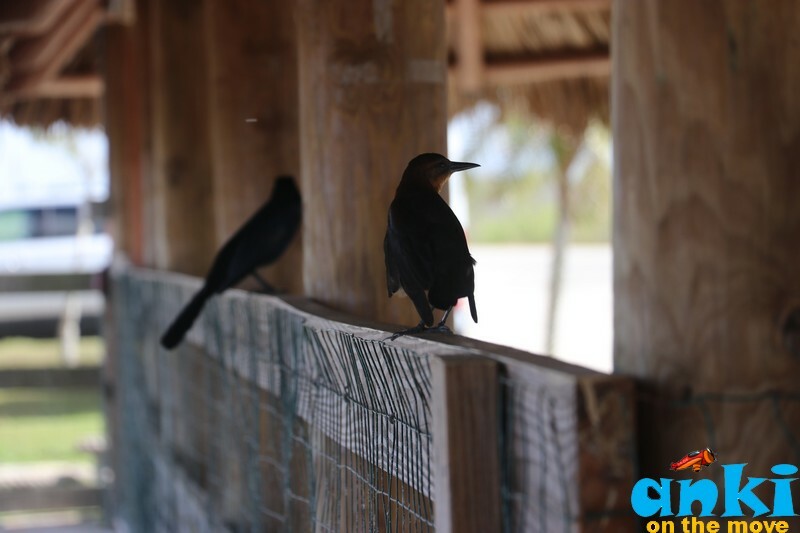 They are commonly used for fishing, bow fishing, hunting, and ecotourism. 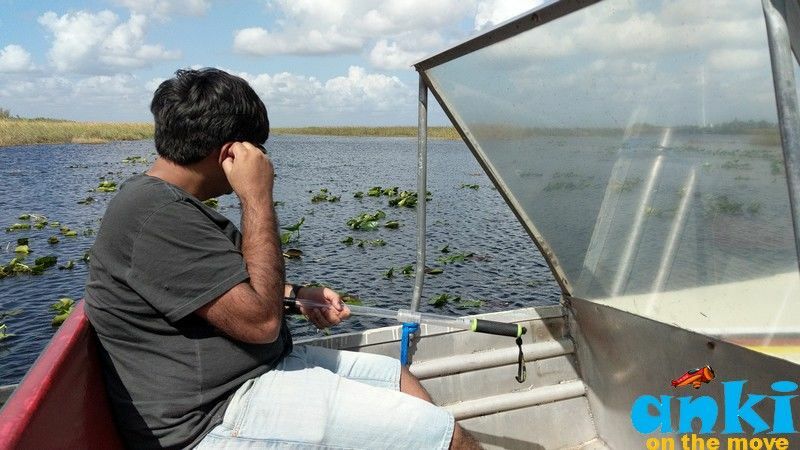 Airboats can be very noisy, so each of us also got ear plugs from the guide. It feels fast on the water waves too, may be because of the wind created by the movement of the boat. 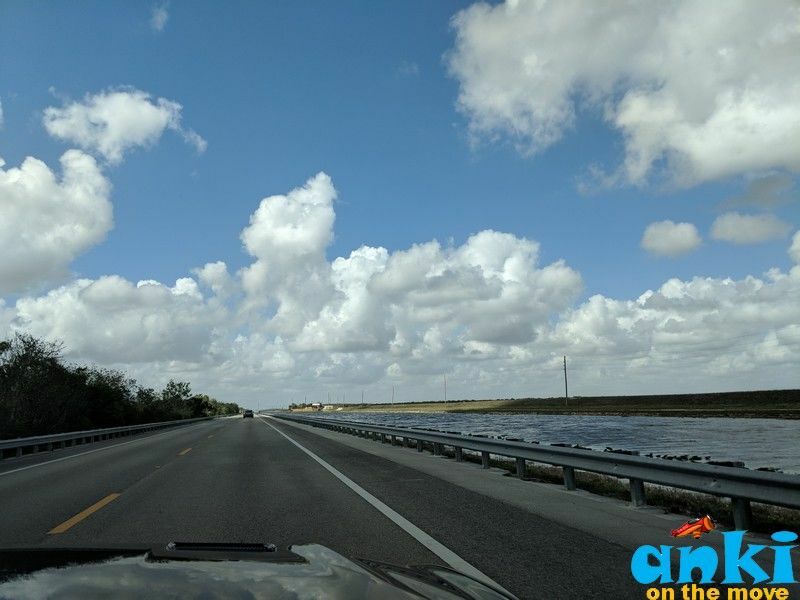 There are more than 50 islands in the Everglades National Park. 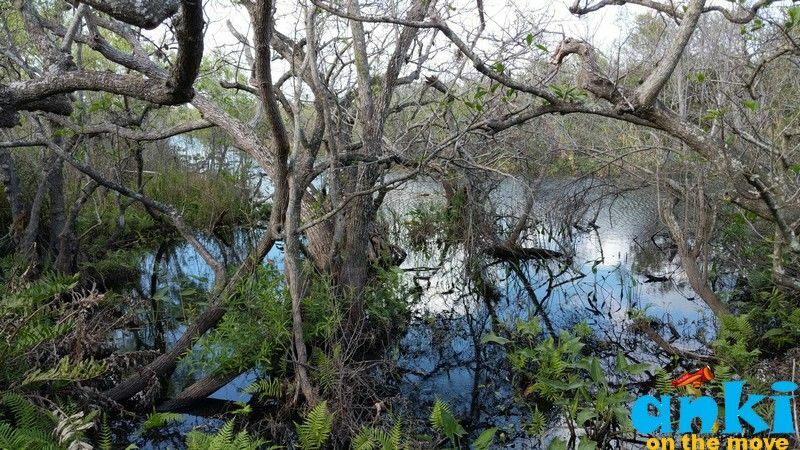 People left the island in the 1960’s as the water got contaminated with pollution from sugar and farm industry with lots of chemicals getting into the water such as Mercury, Pesticides and Fertilizers. The chemicals in the water made many people sick and hence the natives left the islands. 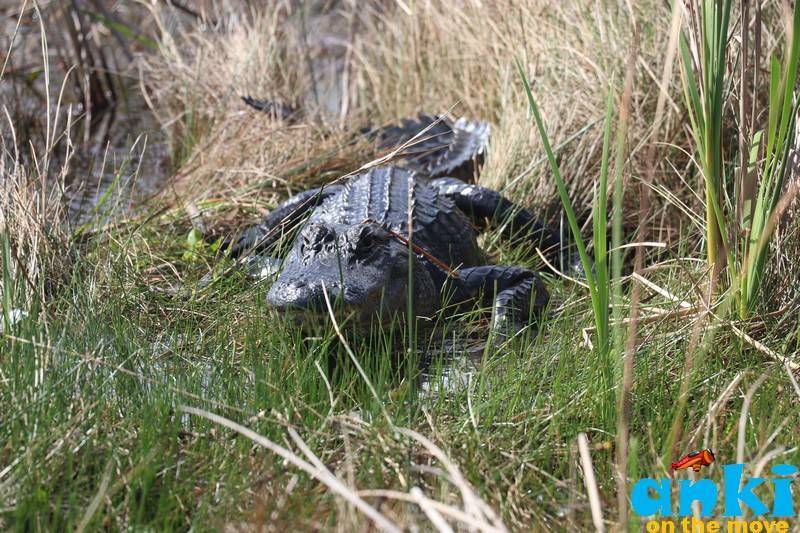 Humans could leave, but Alligators could not, so many of them died. Alligators hence were endangered animals at one time with only 500 left in the wild. They made a big comeback as people started raising them in Gator farms. The Alligators gave 40 eggs at a time. Since people raised them, there were no predators to eat the eggs. Today there are 1.5 million alligators in Everglades National Park. 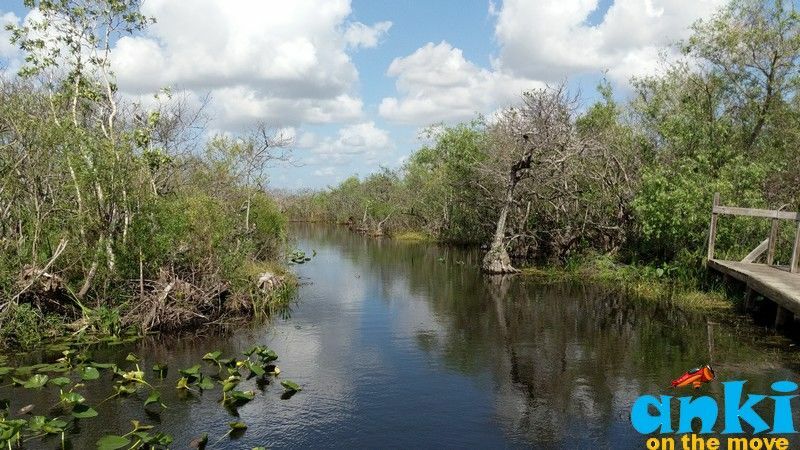 The Everglades is a natural region of tropical wetlands in the southern portion of the U.S. state of Florida, comprising the southern half of a large drainage basin and part of the neotropic ecozone. 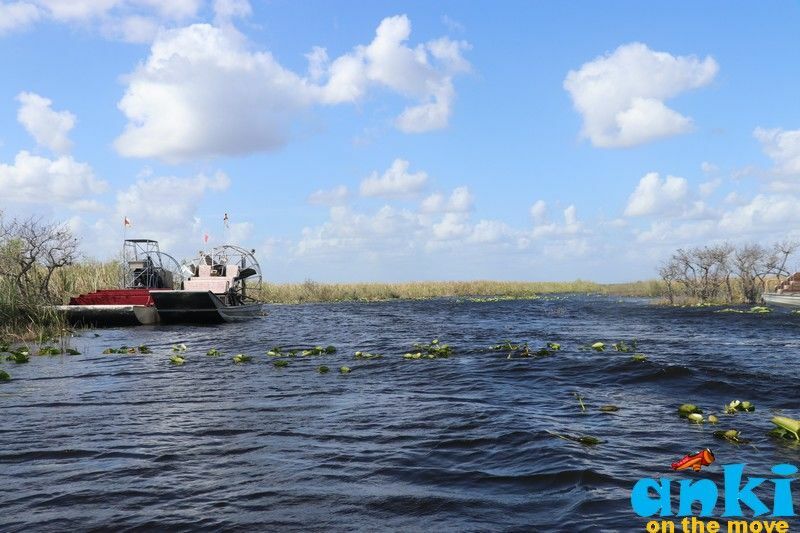 The system begins near Orlando with the Kissimmee River, which discharges into the vast but shallow Lake Okeechobee. 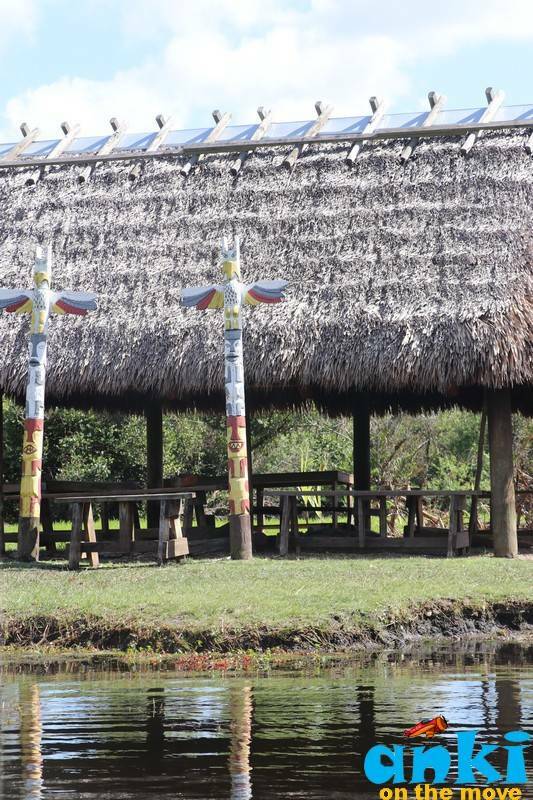 The Seminole Tribe gave the large body of water the name Okeechobee meaning "River of Grass" to describe the sawgrass marshes, part of a complex system of interdependent ecosystems that include cypress swamps, the estuarine mangrove forests of the Ten Thousand Islands, tropical hardwood hammocks, pine rockland, and the marine environment of Florida Bay. 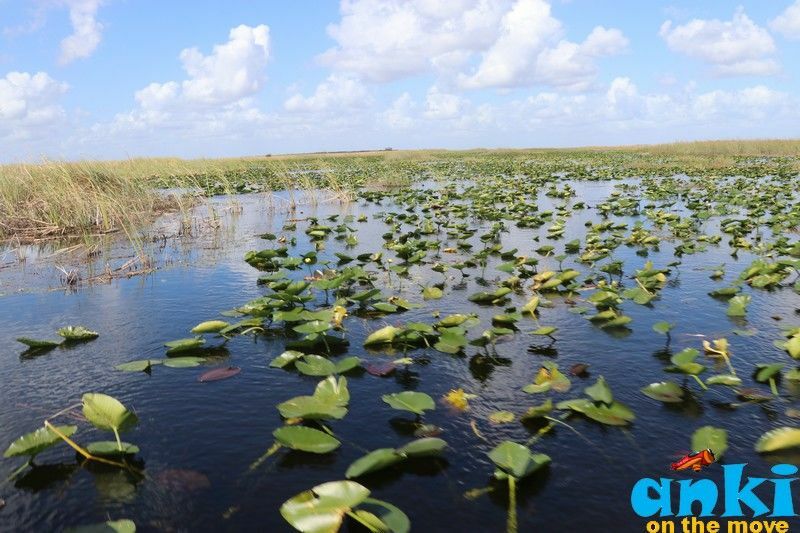 The name Okeechobee comes from Hitchiti words Oki(water) and Chubi(big). Is known as Florida’s Inland Sea, is the largest freshwater lake in the state of Florida. 10th Largest Natural Freshwater Lake in the US. Okeechobee covers half the size of the state of Rhode Island. Is exceptionally shallow for a lake of its size, with an average depth of only 9 feet (2.7 metres). Mayaimi, meaning "big water," is the oldest known name, as reported in the 16th century. The Mayaimi (also Maymi, Maimi) were Native American people who lived around Lake Mayaimi (now Lake Okeechobee) in the Belle Glade area of Florida from the beginning of the Common Era until the 17th or 18th century. The city of Miami is named after the Miami River, which derived its name from Lake Mayaimi. We arrived at the Fort Lauderdale Airport at 10 am from New York by Southwest Airlines. Fort Lauderdale has a free shuttle transfer to the Rental Car Station by companies that own rental cars. Since we had rented a SIXT convertible car from priceline.com, we managed to get into the shuttle that took us straight to the SIXT rental car station. 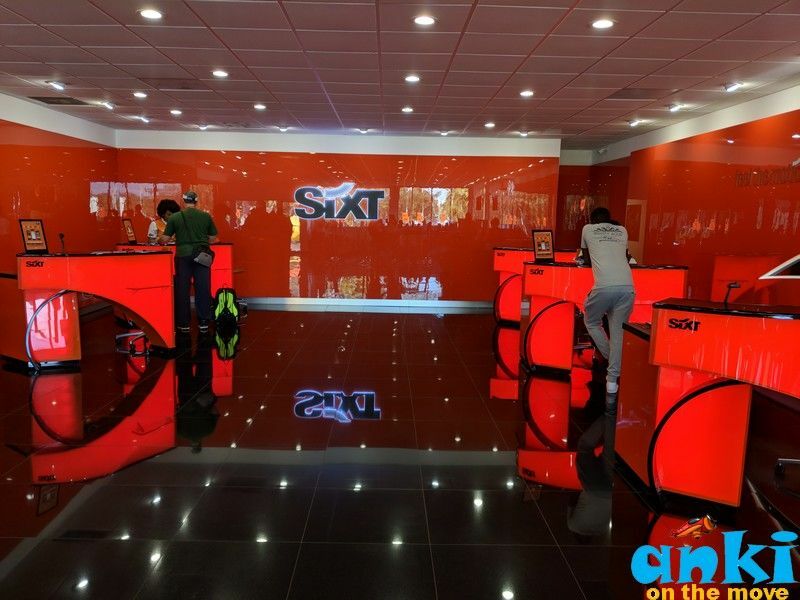 “It was our first time renting car from SIXT. They had great customer service at the sight. Request GPS if you are venturing on interior roads. 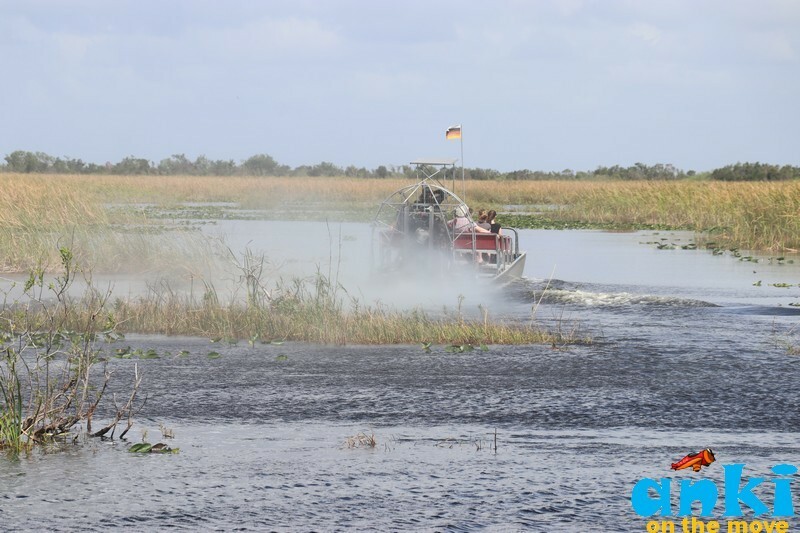 How we took Everglades Airboat tour? 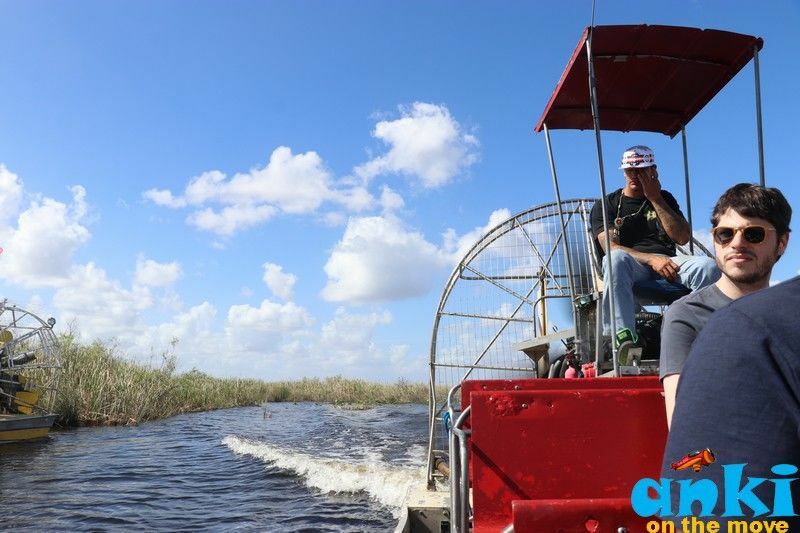 As soon as your vehicle nears the Everglades, you would spot couple of tours that offers the Air boat rides on both sides of the road possibly paired up with marshy lands and water. 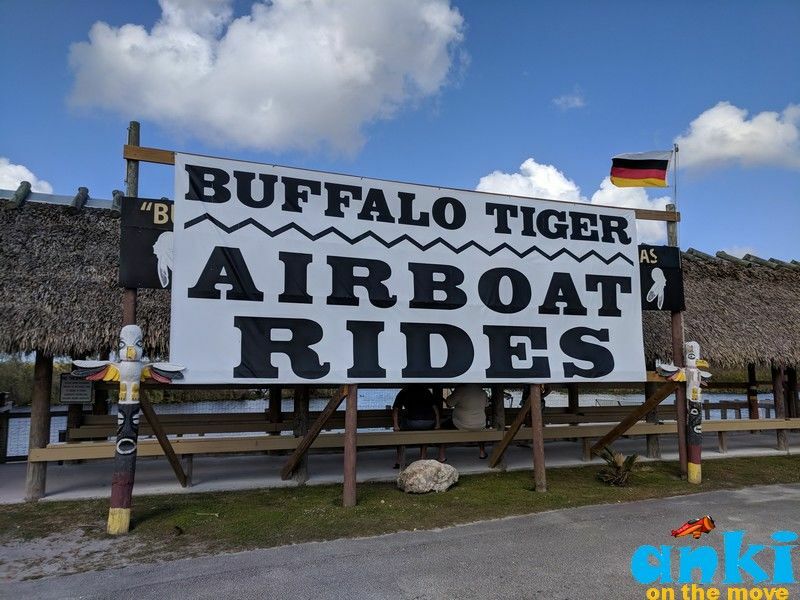 We generally go with reviews if we are taking local tours and since Buffalo Tiger's Tours had great reviews on TripAdvisor, we opted for that! What we learnt: There was barely any internet in and around Buffalo Tiger's Tours. 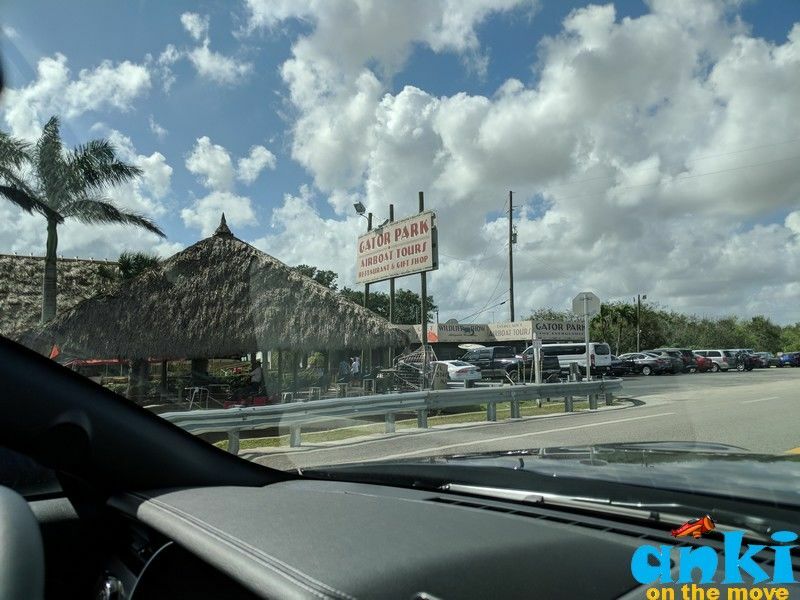 Buffalo Tiger's Tour is on the right side of the road if you are coming from Ft Lauderdale. What we learnt: That these tours have end times. Confirm before you drop in. Also keep some spare time. The tours may be crowded. We hadn’t booked our tour in advance online because we weren’t certain of flight delays if any etc. 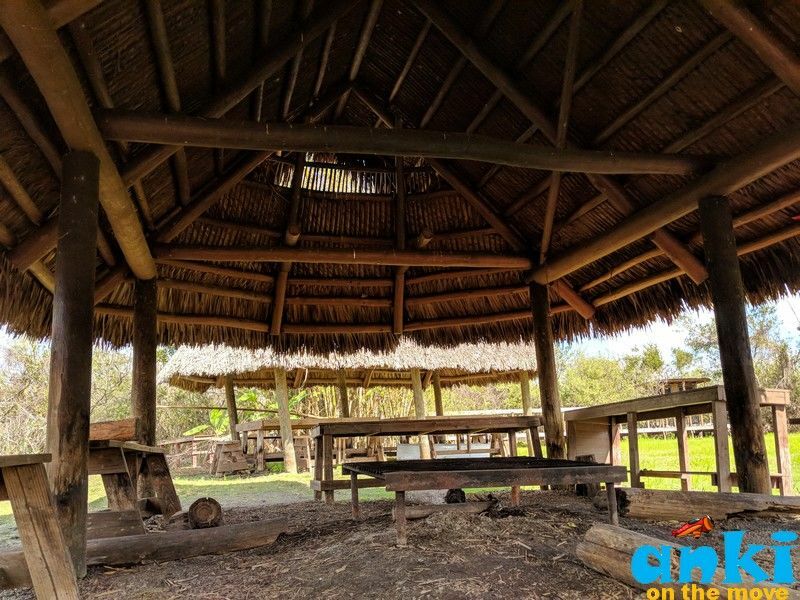 "This tour was originally owned by Mr. Buffalo Tiger and Mr. Tiger was one of the last chief of tradition for Miccosukee Tribe. 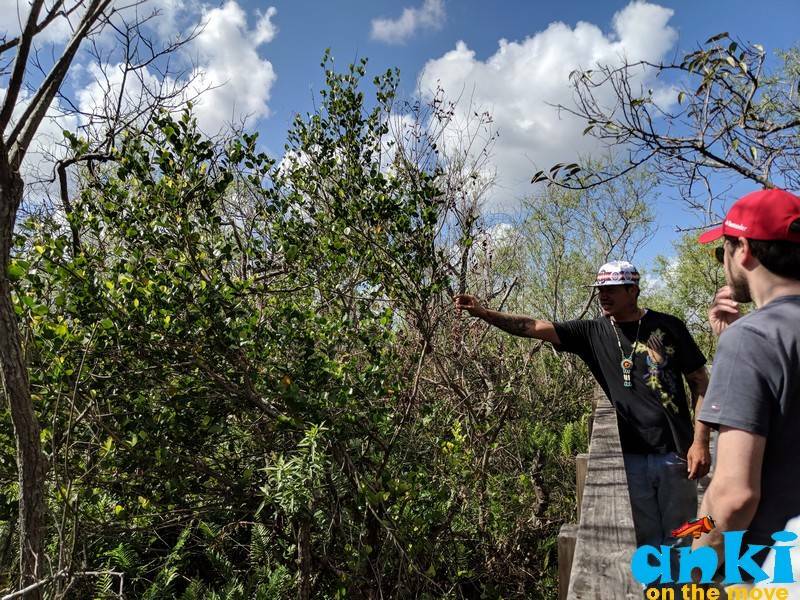 My dad was Apache Indian he came when he was young and grew up with one of the sons of Mr. Tiger and thats how I got involved with Miccosukee tribe," says our guide. How it works: As soon as you enter Buffalo Tiger's Tours Desk, and ask for booking of the tour, you will be assigned a token that mentions the group. The lady at counter had suggested that we take a walk around because our turn might take 40 minutes. What we learnt: That it takes way lesser than 40 minutes. That if you miss going in your group, they might assign you a next group which either can be very late or not on the same day even. One of the couple happened to miss their group and the confusion and chaos at the desk wasn’t kindly catered to. So, no missing groups, no not even for the hot gator nuggets! I would suggest to be at the spot where group names are called. Be in the waiting line. Loved the birds that sat and the cat that was there! 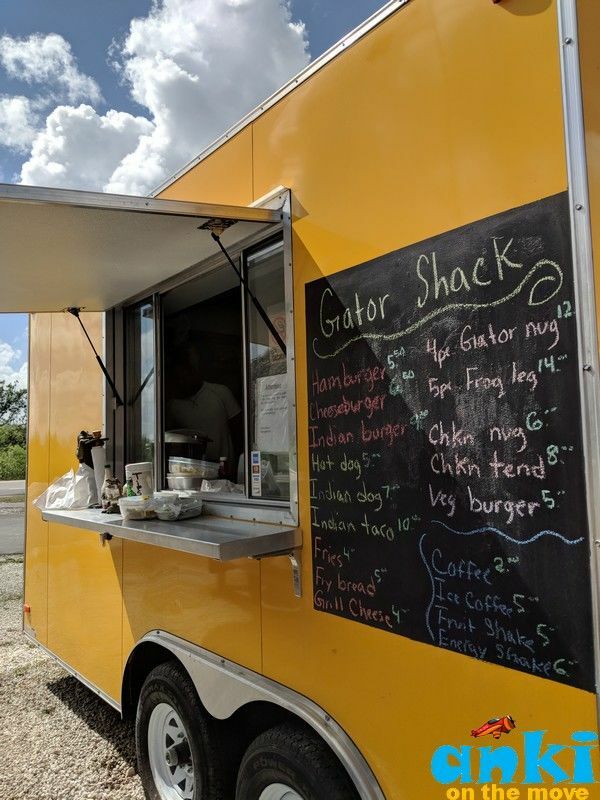 So even if it’s tempting, don’t order Gator Nuggets at the shack unless your waiting time is more than an hour. Because making Gator nuggets can take time and the group can move fast. We missed out on our boat too and then got reassigned on another time that was after 40 minutes. So it was loss of time for us indeed. It takes time to make these. 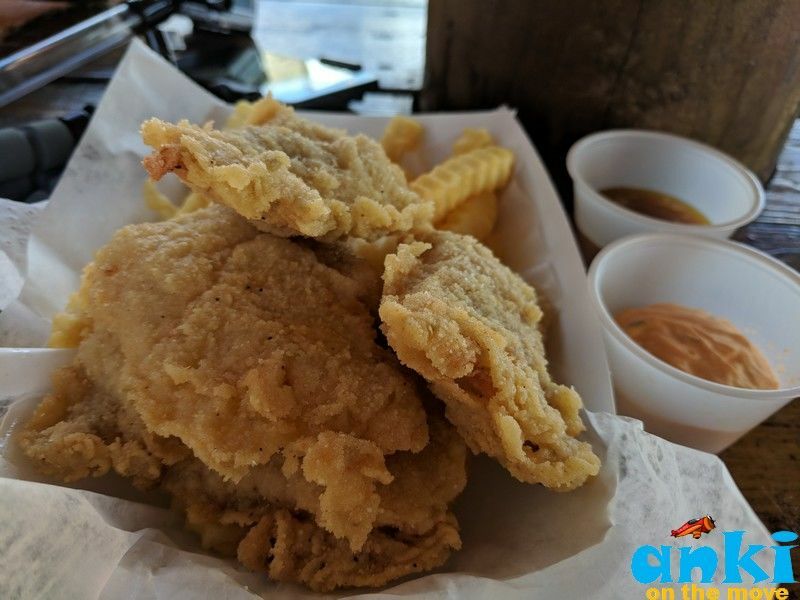 The Gator Nuggets tastes similar to Chicken but not quite exactly alike. It's more harder meat. Our first stop was where a female alligator was. 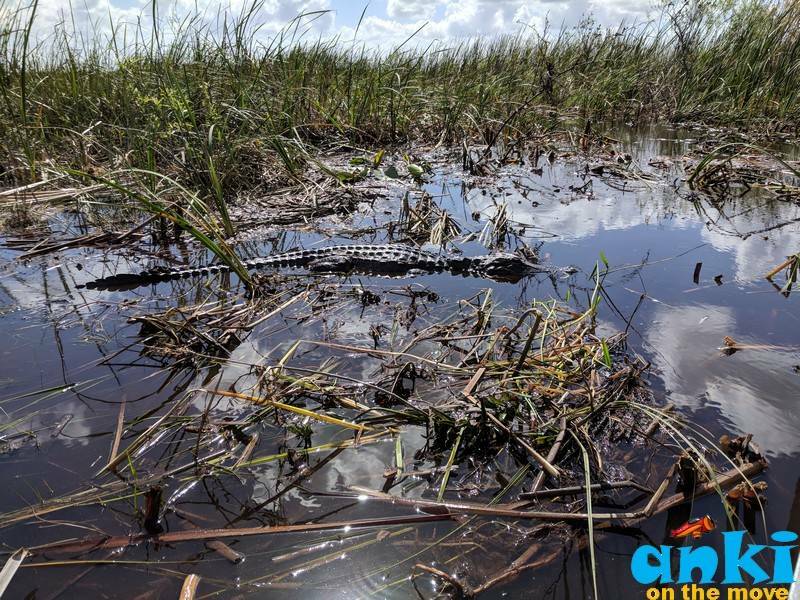 I randomly asked him “How do they know if an alligator would be there?” and he said “ When we ride an Airboat, we make sure that there is nothing in front of us, so we don’t go too much on the big grass. If he’s resting out on the mud pies you could harm them. The Alligator who is slowly trying to wade away. 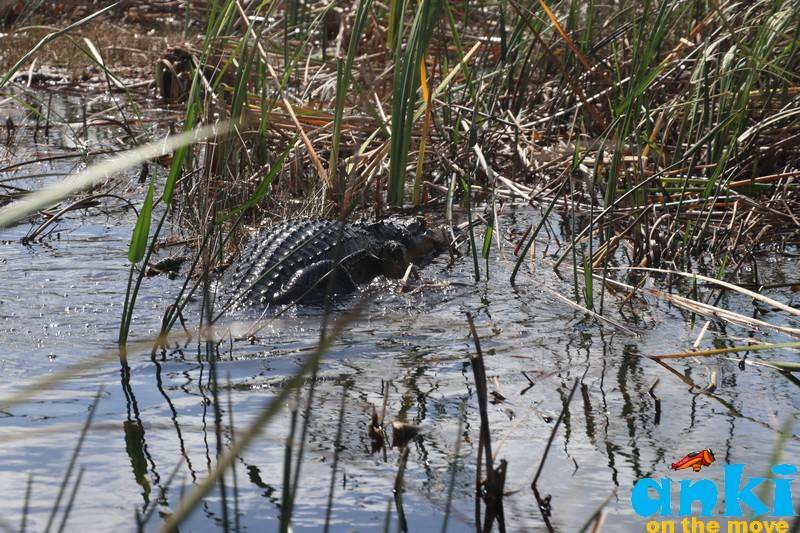 • The first female alligator which we spotted was a teenager of about 15-20 year old. • Generally a female alligator is smaller and slimmer than their male counterparts who are fatter. • The women’s nose is narrower and men’s nose is wider. • A women is shorter in length at about 11 feet 3.5 meters and men are 15-18 feet long and 6 meters wider. 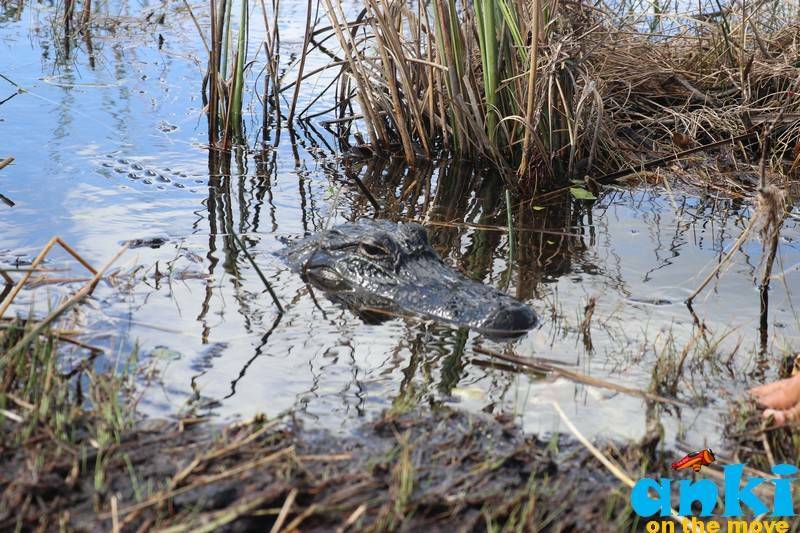 • Female alligators live to be around 50-60 years old whereas male alligators can up to 70-80 years old. 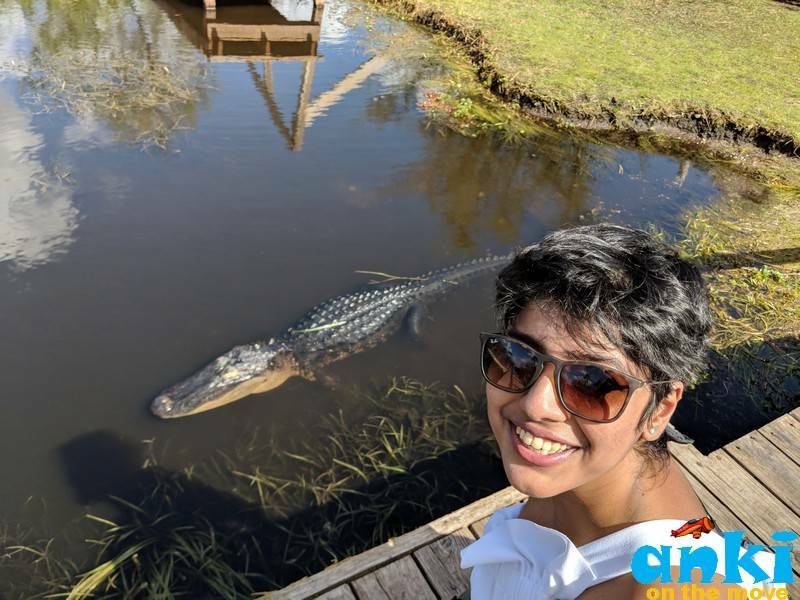 Talking of teeth, an alligator has 40 teeth on top and 40 on the bottom and whenever they break their teeth, there are 1000’s of extra teeth that grows back. An alligator has about 2300 pound sq. of biting power. Whatever they get in their mouth, they’ll eat. If its food, they’ll eat. If it’s not food, they’ll spit. In the wild, they can eat fish, big turtle (it takes an hour to crack it and they eat it along with the shell) etc. Things are a little different in the wild than real life. There are sometimes multiple suiters for one female. Then 2-3 guys have to fight each other for the women. Women, however would mate just one man. Men would be with multiple women making rounds. • The baby mama lays about 20-40 eggs and these eggs look like chicken eggs. • They have to be kept wide and high up in the mud pie. • Eggs take 80 days to hatch. However, not all babies or eggs survive. • A lot of animals eat those including big birds, big fish, big alligators etc. • Mom watches for a year, and after a year, the babies would go on their own. When the eggs hatch 10-20 babies come out and at the end of everything only one or two remains. One of the very weird thing about the Alligator is that their eyes are big and round which can actually sink in the skin. At the Alligator Wresting Show, the lady showed us how she could press an eye about an inch inside and it doesn’t hurt or bother them and these eyes will pop back as if nothing happened. 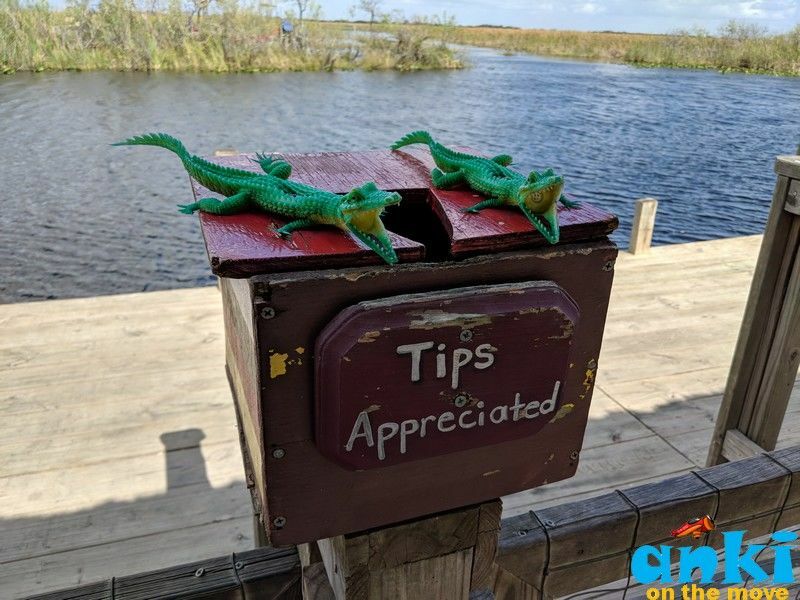 Alligator’s day vision is poor. They don’t see in the center and the middle and can’t see at the back. 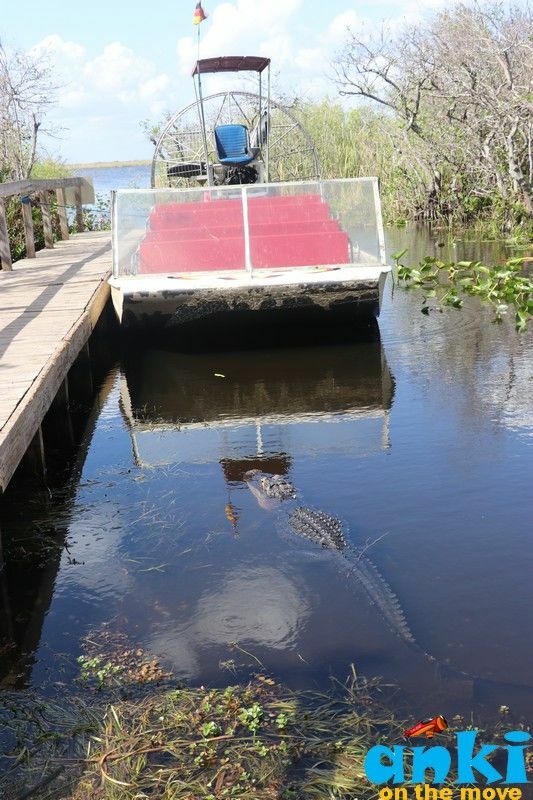 Alligator can only see from the sides. Anything that is close to their sides, they’ll try to grab and they don’t like if something is at their back. 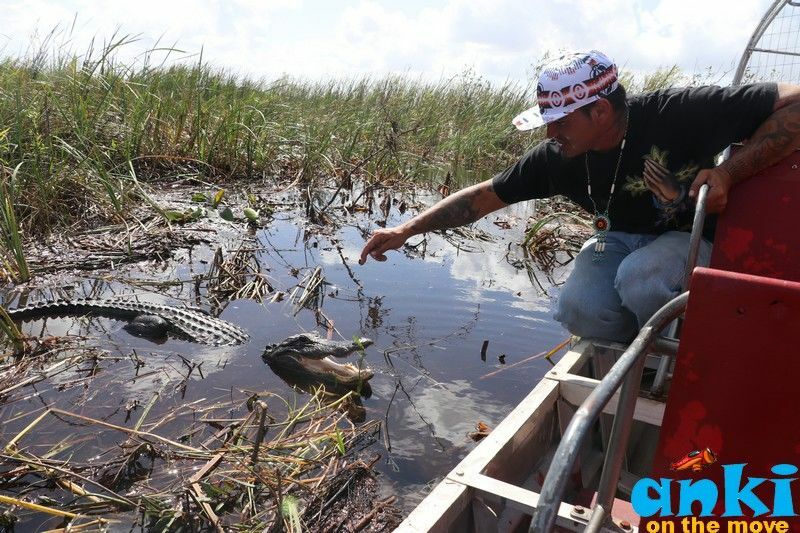 How native Miccosukeens used to catch Alligators? 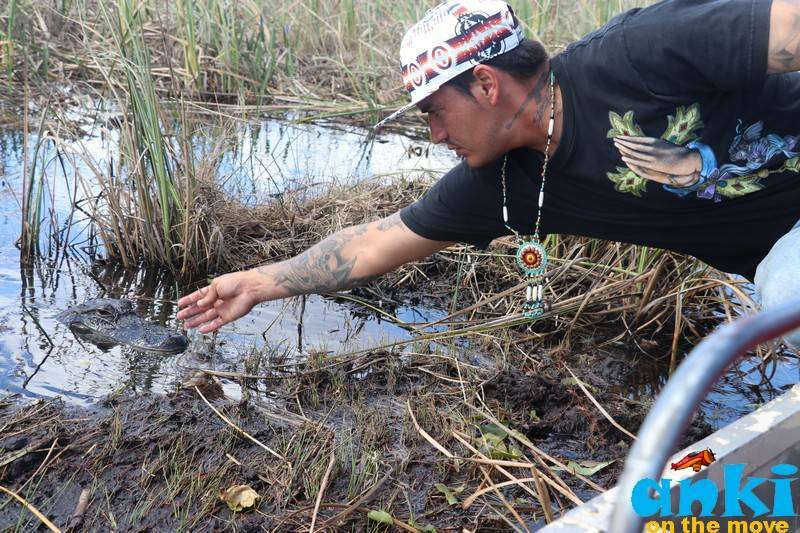 "The native Miccosukee and Seminal tribes used to take advantage of this blind spot, jump at the alligator from the back and was called quick catch. If he can see them from the sides, they can bit them. So jumping directly from the back, they would put their hand straight on the neck and let it rest for 30-40 seconds until it realizes that it’s not threatening to them. The native tribes would go alone and they came up with their own technique on how to get hold of the alligator. 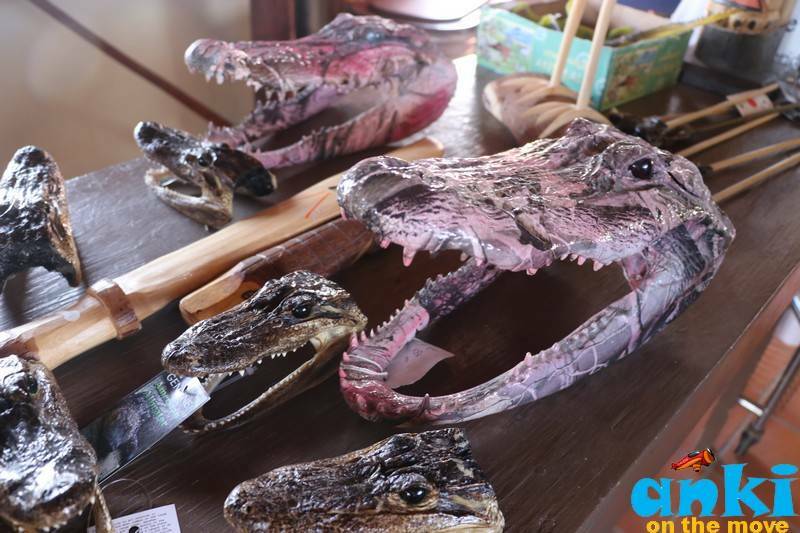 The meat then would be cooked and eaten," says the performer at the Miccosukee Indian Village Alligator Wrestling Show. 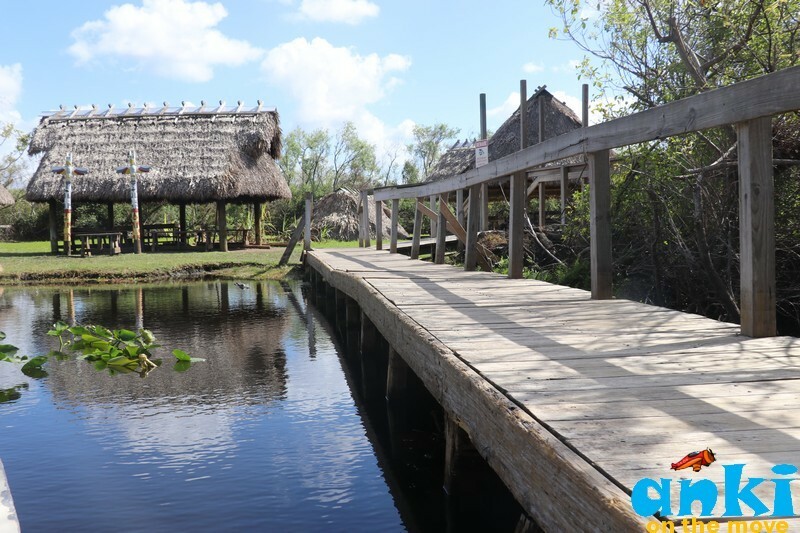 The tour also had a visit to one of the islands where two native families of the Miccosukee tribe used to live once. 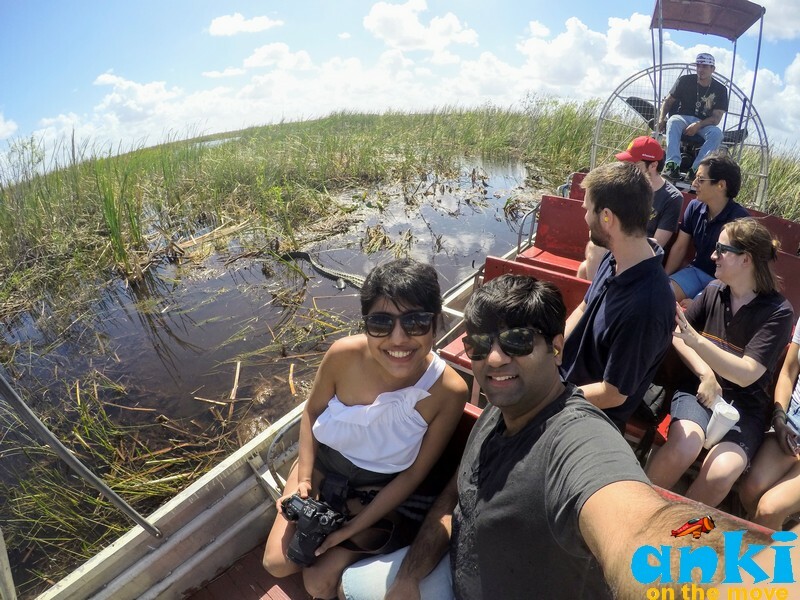 There are about 50 islands in the Everglades and they are of different sizes. Some islands are small and they hold single families. Some are larger and hold multiple families. There we saw traditional homes what in native language is called “Chikki”. Cook Chikking - Chikki in which you can sleep. Sleep Chikki - Where you can sleep etc. Usually, a family of mom-dad and kids sleeps together and in a table covered with palm meadow trees which is elevated from the ground. They never used to sleep in the ground as Alligators or mostly snakes can get them. The wood they used to use at these Chikkis were Cypress Trees which grows in the water and is naturally water resistant to rain. The wood lasts 80 years. 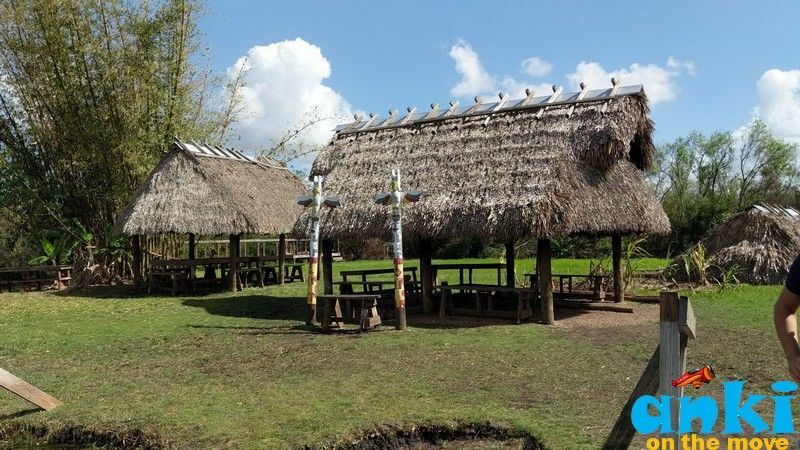 The roof is made of Palm meadow trees and when thatched together can survive 15 years. A brown snake with black wavy pattern. 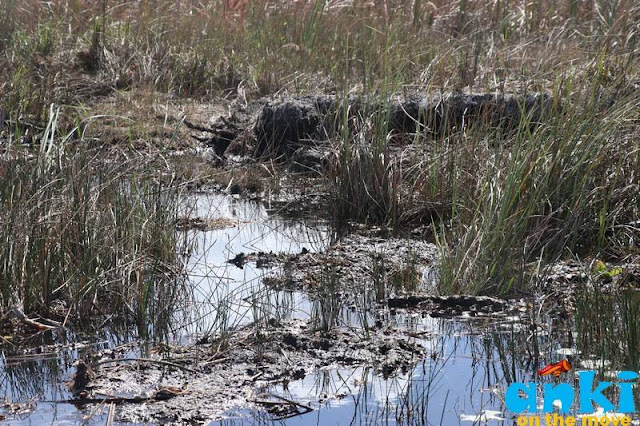 It is very common in the Everglades. 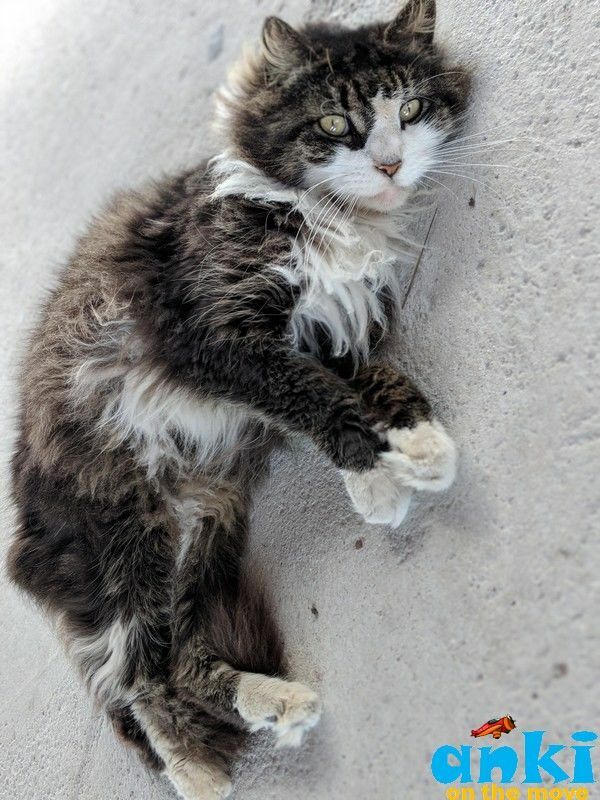 If you get too close to him he is an aggressive snake and he will try to chase you and bite you. The last man that was bitten was in September - he was walking in the Shark Valley Nature Tour and he walked by the bush and he didn’t know snake was there. It is like if you come close to him it will come after you. He walked too close and he was just walking and the snake came and bite him. The Helicopter has to take him as Helicopter is the quickest way to take to the hospital. Coral snake is the most toxic snake in the everglades - three patterned snake - black, yellow, red . It bites you you only have 20-30 min to go to the hospital. From this place, the nearest hospital is 50 min away. If it bites you and you are too far, you are not going to make it in time. 3. Diamond back Rattle snake(larger snake) Any of the bites you you have 40-50 min to the hospital. 4. Pick me Rattle snake (smaller snake) Any of these bites you you have 40-50 min to the hospital. We also did a small hike trail in one of the native islands. Our tour guide pointed us towards leaves of a tree. He says "Put this in hot water, it will make tea. If you have pain, you will drink and the pain goes away. People use this tree today to make aspirin. The branch of the tree has salicylic acid. Takes your pain away." We ended our trip to Buffalo Tiger Tours by taking a quick look at their souvenirs. They were fabulous. Wish I could pack them in and bring them back!